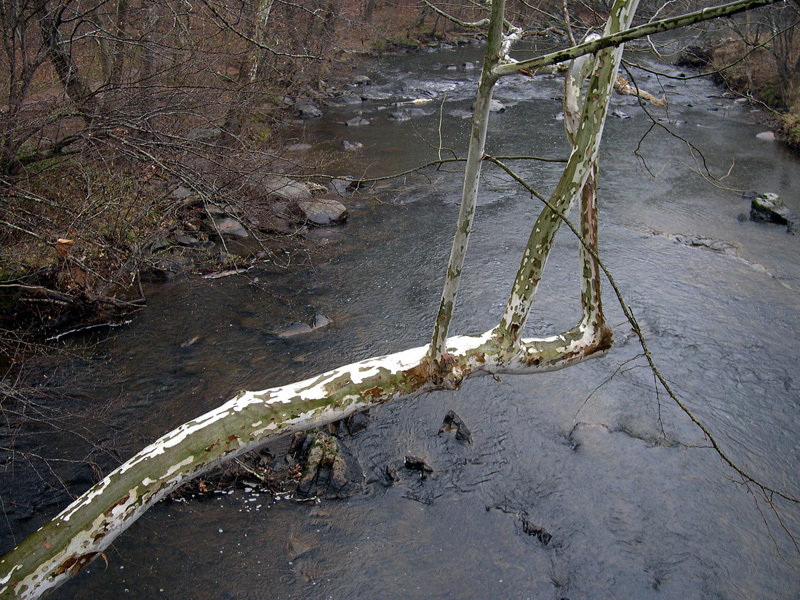 The photographs of Platanus wrightii a couple days ago inspired Dr. Quentin Cronk to submit his photographs of Platanus occidentalis, or American sycamore (or American planetree), from Eno River State Park in North Carolina. Coincidentally, he took these photographs two days before I took the ones in the Chiricahuas. Dr. Michael Dirr has this advice to give on the landscape value of this tree in his “Manual of Woody Landscape Plants” : “If native to an area do not remove the tree(s); however, do not plant it…”. Dr. Dirr cites diseases and pests such as anthracnose and borers along with the messiness of its fallen leaves and fruits as some of its undesirable characteristics. He considers the potential diseases and insects so bad that he concludes the list with “ad infinitum”. The Flora of North America entry for Platanus occidentalis notes: “Of the angiospermous trees of North America, Platanus occidentalis is one of the tallest (to 50+m) and reaches the greatest trunk diameter (to 4+m)”. 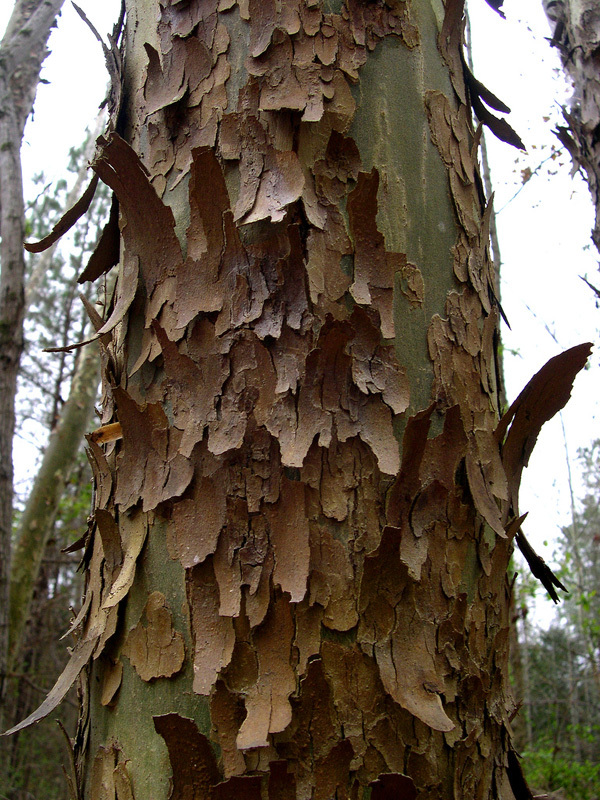 Too bad this species is not suited for cultivated landscapes – its size and intriguing bark (amply demonstrated here by Quentin) would make it very appealing as a specimen tree in a large park. Art resource link: I’ve linked to this site previously, but the American Society of Botanical Artists has a listing of upcoming art exhibitions in Brooklyn, Pittsburgh, New York, Seattle, Tucson and Melbourne. If you live in (or plan to be visiting) any of these cities, you might like to take the time to visit one of these exhibitions. I’ll be visiting the one in Seattle, myself. Despite Dr. Dirr’s advice, I find this tree is fairly common in public spaces here in the east, including about 10 recently planted at my daughter’s school in Northern Virginia. Finding one of the huge fallen leaves of a mature specimen is a treat. Although a rank amateur compared to most viewers, I enjoy your photographs and commentary immensely. Thanks for sharing the knowledge. London Plane has an advantage over P. occidentalis as it is less susceptible to plane anthracnose, a fungal disease that can defoliate P. occidentalis (makes it look very ugly in summer!). These trees were planted as street trees about 36 years ago and their continual leaf drop all spring, summer and fall is a nuisance and unsightly. I have always appreciated the beauty of the bark patterns of sycamore. However, after having previously lived where there were several of the trees in my yard here in Maryland, I can report another problem. I am allergic to sycamores. Any time I mowed under the trees or raked their leaves, I had tearing, sneezing, and breathing difficulties. Wearing a mask did not help much. There are no sycamores where I live now, so I can admire them in other people’s yards and our public areas. I grew up in a southside suburb of Oklahoma City and was around Sycamores all my life! They were planted as decorative trees on each lot over 75 to 100 years ago and are now huge mature specimens for the most part. They were co-planted with Elm trees at the time. Dutch Elm disease killed many of the elms, though some of the older specimens survived well, but almost all of the original Sycamores are there unless removed by lot owners. They made for beautiful shady streets in the hot summers and the balls were useful when I wanted something hand to throw at my brother! It is likely, though not by any means a guarantee, that the sycamores / plane trees in some of the above recollections are London plane, Platanus ×hispanica, a hybrid that is thought by many to have Platanus occidentalis as one of its parents. As Michael F mentions, it is far more disease-resistant, as well as being tolerant of soil compaction and urban air pollution. We have a lot of London plane in Sydney, Australia and the leaves are a nuisance, and it is claimed that they are the cause of many peoples allergy symptoms, but there are others who disagree. Hopefully there will be no further plantings, we have a lot of more appropriate native plants. Leave a Reply to Beverley Click here to cancel reply.